See your golf game as you never have before. See what it takes to improve consistency and performance on the links. "Golf Anatomy" will show you how to lower your score by increasing strength, power, and range of motion for longer drives and more accurate shots." 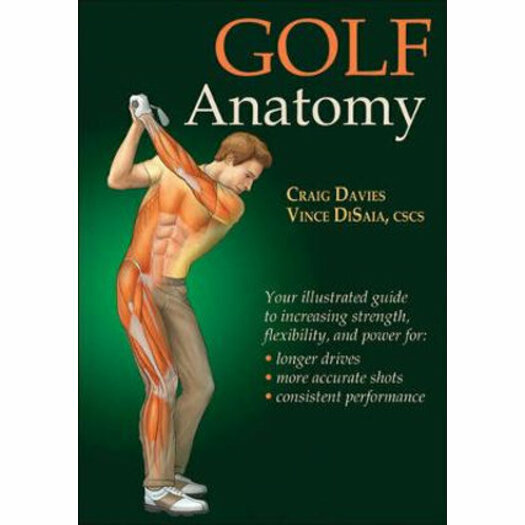 "
"Golf Anatomy" includes 72 of the most effective exercises, each with step-by-step descriptions and full-color anatomical illustrations highlighting muscles in action. "Golf Anatomy" goes beyond exercises by placing you at the tee, on the fairways, and on the greens. You'll see how to improve mobility, stability, body awareness, and muscle strength to add distance to drives, consistency to your short game, and accuracy to your putts. From sand traps to awkward lies, "Golf Anatomy" will prepare you for even the most challenging of shots. Plus, you'll learn how to stay at the top of your game with targeted injury-prevention exercises for the lower back, elbows, wrists, shoulders, and hips. Combining expert instruction with beautiful, full-color illustrations, "Golf Anatomy" is truly an inside look into the game. Whether you're a scratch golfer or simply a fan of the game, this book is a hole-in-one.